I think everyone's heard famous U2 singer Bono lost his luggage when a door came open on his Lear Jet a few weeks ago. What most people probably don't know, is the foldable luggage Bono was using also happens to be the Biaggi Folding Luggage coming to the Shark Tank in Episode 613. Now what's the odds of that? O.K. maybe the Colbert Report may have exaggerated the story a bit, but out of all the Luggage Brands on the market, Colbert chose a Biaggi bag. It seems like Stephen Hersh, the inventor of the Foldable Biaggi Luggage, has been getting lots of national attention lately for his line of products. The Biaggi Luggage was also featured on the Today Show last month, and now will appear on the Shark Tank Show next Friday night on December 5, 2014. One of the most popular Biaggi products is the large 28" four-wheel expandable upright that collapse's down 50% when not in use. The biggest problem with suitcases ever since wheels went on luggage was the increased bulk non-collapsible size. Hersh has completely solved this problem storing bulky luggage and shed several pounds off the average suitcase at the same time. The majority of entrepreneurs come into the Shark Tank looking for connections to expand their Brand. 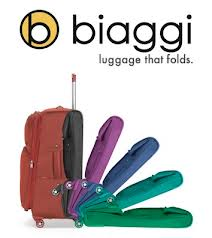 The Biaggi Luggage, however, already seems to be available at most larger suitcase retailers. Now why would an established and obviously very successful product need to go on the Shark Tank in the first place? That's a great question that no doubt will come with a high price tag for the Sharks to invest in the Biaggi foldable luggage. The advantages using collapsible luggage with wheels is such a good idea, it's only a matter of time before this will change the entire industry. The Biaggi solves several very real travel related problems dealing with suitcases and carry-on bags, folding luggage could easily transform this entire market.